This is probably the oldest picture I have of Bubbly. I think she was about 18-22 months old at the time. That’s not me holding her, that’s a wonderful young woman who now has a beautiful daughter of her own. I am grateful to this woman everyday for picking up my daughter and showing her love in a world where that didn’t happen on a day-to-day basis. Bubbly was likely not wearing a diaper either, and since she wasn’t potty trained until much later, we all know the risk this lady was taking. She didn’t care how dirty Bubbly was though, she carried her around and loved her. That makes my mom heart hurt in a good way. Yesterday, I sent our not so tiny (she’s very tall now) Bubbly off the Kindergarten. 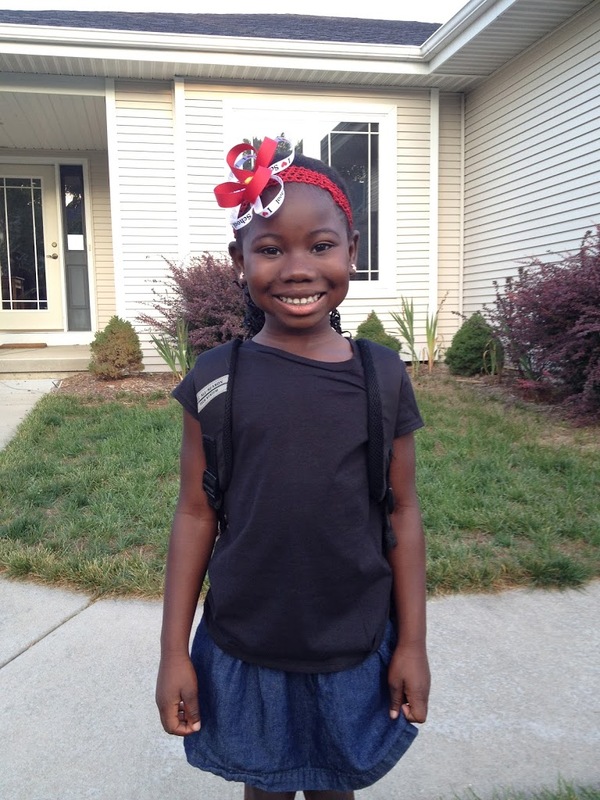 As we walked up the sidewalk to the school, ready to line up with her Room 4 friends, she tugged on my hand. “I’m feeling a little nervous” she said in a quiet voice. My heart clenched as I took her little chocolate hand in mine and reassured her that it was going to be alright, that everyone would adore her, just the way I do. In the space between these two photos, so much has happened. Her little heart has healed. She can tell me how she feels instead of crumpling to the floor in a mess of nerves. She has learned how brave, how smart and just how beautiful she really is. Is it possible to be so inspired by someone who is so much smaller than you are? I am. Bubbly, if I don’t say it enough, because there is never enough, you amaze me. I am so lucky to call myself your mama. I am proud of the space between, of everything we conquered, and overcame, to get us here. As we navigated that space, there were moments that I wondered what good could ever come of this. I wondered why I couldn’t be stronger. I wondered why God had chosen YOU and ME for this journey. who is ready for the next space between. BEAUTIFUL! Love this sooooo much. I just LOVE this! You are a rock star mama in my eyes and I am so glad you shared your blog on fb so I can start stalking it! 😉 You…and the precious princess in this post…and your entire amazing family…inspire me.